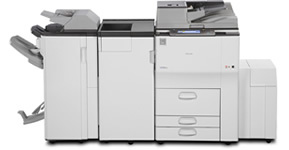 The new Ricoh Aficio MP6002SP is a powerful all in one system that offers the very best in performance with top quality results that demonstrate Ricoh's dominance in the high speed traditional copier market. The Ricoh Aficio MP6002SP is the true multifunctional version of the MP6002 with Network Scan and Print pre-installed. The Ricoh Aficio MP6002SP offers the following features.